Jacksonville is just one of many cities in the Sunshine State of Florida. 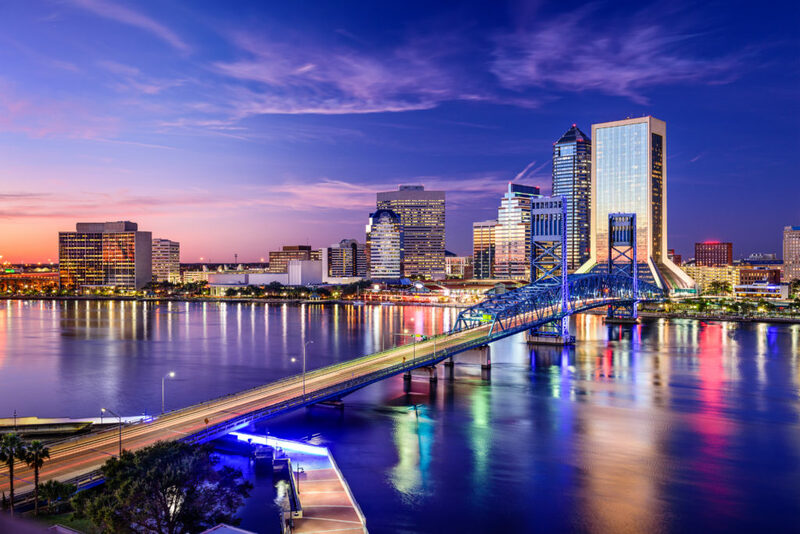 Located in the northeastern part of the state, Jacksonville is a popular vacation destination due to its nearby beaches, golf courses, and other amenities. In addition, the city is also well-known for being a cruise port terminal to destinations around the globe. Seeing that the city is the largest in the state, Jacksonville offers its residents a mix of entertainment options, including music, art, and theater. Due to its beautiful weather, low crime rate, great school system, and location to other major cities, it is a prime destination for families, business professionals, and retirees. If you are thinking about calling Jacksonville your forever home, then there is a lot of work to be done. We understand how challenging a move can be. This is why we offer hassle-free car shipping services to relieve some of the stress. You won’t have to worry with traffic, poor weather, or potential breakdowns. Instead, you can focus on more important matters. Learn more about Florida Car Shipping. Many people come to Jacksonville to take advantage of the shopping, dining, retail, and entertainment options available. No matter what your reason is for moving to the area, we offer car shipping services to fit your needs. Here are a few things to keep in mind. When selecting the type of transport carrier, you have two options: open carrier shipping and enclosed carrier shipping. Both methods provide a safe way to transport your vehicle to its destination. While open carrier shipping is the standard transport method, it does not protect against external elements. Therefore, enclosed carrier shipping is better suited for high-value vehicles, such as classic, exotic, and sports cars. Door-to-door delivery saves you time, allowing you to focus on other moving day tasks. Instead of having to drive to and from a terminal location, your car will be delivered directly to your home. This makes it easier and more convenient for you. Find out if this service is available in your area. If not, a local meeting place may be better suited. When it comes to preparing a car for shipping, there are several things that you must do. For one, you must ensure that you have removed all of your personal items from the car. Not only are these items not covered by insurance, but transporting them could cause potential damage. In addition, it is recommended to keep the gas tank at one-quarter full and perform an inspection. Your contract should outline, plainly, what you have already discussed with the auto transporter regarding deposits, timeline, and more. If you do not understand any part of the contract, do not sign it. Ask questions, first. This will ensure that everyone is on the same page prior to transport. Let’s not forget that Jacksonville is also a location for outbound moves and car shipping needs. In other words, people not only move into the city, they also move out of the city. Maybe you have found a better home, elsewhere. There are also instances when individuals purchase cars out of state. Whatever, the case may be, National Dispatch provides car shipping services to and from Jacksonville. With a population of over 800,000 people, there has to be a list of reasons why longtime residents choose to stay and why others are flocking to the area. Here are just a few reasons why people are moving to Jacksonville. One of the many perks to living in Jacksonville is its proximity to other cities. Many other major cities in Florida, such as Miami, Naples, and Orlando, are just a few hours away by car. In addition, it won’t take you very long to reach other neighboring states, such as Georgia and Alabama. Your taste buds are in for a real treat in the city of top-rated chefs and unique culinary masterpieces. There is something to satisfy every appetite. Whether you are in the mood for a burger or Middle Eastern cuisine, you can find it here. The city also has many restaurants that offer vegan and gluten-free menu options. Seeing that Jacksonville is near the Atlantic, there is no better city to get a taste of the ocean with its numerous seafood choices. During most of the year, the temperatures stays above 70 degrees. Even in the winter, the average low is in the 40s. This makes it easy for residents and visitors to get out and enjoy one of Jacksonville’s many beaches, parks, and gardens. The city is very much a water lover’s paradise with opportunities to fish, boat, and swim. Due to the number of Fortune 500 and 1,000 companies in the area, Jacksonville makes an attractive location for business professionals. You will find companies from a variety of industries, including finance, hospitality, and retail. In addition, the city hosts a low unemployment rate. The housing prices are also low, which serves to attract future residents to the area. After deciding to ship you car, it is important to know who you will be shipping your car with. Let us tell you a little bit about our company. National Dispatch is a nationwide car shipping company with a company-owned fleet. We ship cars for military personnel, families/individuals relocating, corporations, retirees, construction teams, and more. Our top priority is the safety of your vehicle during auto transport. Therefore, we treat your car as if it were our own, with the utmost care. If you are looking to get a competitive car transport rate, use our quote form to get a free car shipping quote in seconds. No personal information is needed to get a quote. To speak with one of our car transport representatives, call us at 800-321-2051 or chat with us online.